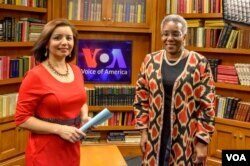 In a special interview with VOA's Navbahor Imamova, US Ambassador to Uzbekistan Pamela Spratlen reflected on her first year in Tashkent and discussed several critical issues, including Congressional restrictions on Uzbekistan, forced labor and the Cotton Campaign, business and economy, educational opportunities, and the critical role media play. Navbahor Imamova, VOA Uzbek: Madame Ambassador, it is a great pleasure to have you here. Ambassador Spratlen: Thank you! It is a great pleasure to be here! Navbahor Imamova, VOA Uzbek: You came here all the way from Tashkent. So we really appreciate that. Ambassador Spratlen: I did and it's always a pleasure to be here, and I have to say, I'm leaving Sunday and I'll be very happy to get back as well. Springtime in Uzbekistan and it's very, very nice. Navruz is coming up. We have some visitors coming to see which we're delighted about, and so, I think it's going to be a very good spring as part of a very good year. Navbahor Imamova, VOA Uzbek: You've just started your second year in Tashkent. 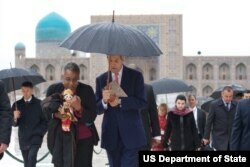 What would be the defining features of Ambassador Spratlen's time in Uzbekistan? Ambassador Spratlen: They're just so many special moments. Starting with my arrival, I have to say I was welcomed from the beginning. The foreign minister received me just a couple of days after I arrived and then I was extremely fortunate to have a meeting with President Karimov in order to present my credentials. Shortly after that, he gave a lot of time to the relationship with the United States and he has had a long time to long at this relationship and think about it and so, I was very pleased that he took the time to spend with me on that. That really launched a wonderful year. We had many visits and we had an Afghanistan briefing team that came out and talked about our security relationship. We know this is an extremely important part of the relationship for Uzbekistan because there's a lot of worry about what is going to happen in Afghanistan in the coming years. There was a lot of concern about the reduced military footprint of the United States, and so having that team come out and explain our vision for Afghanistan and what we thought the implications were for our partners in Central Asia, that was extremely important. That got us off to a nice start. We had Mr. Todd Chapman come, another security related visit that was from the political military bureau, to talk about the problem of ISIl. And then, we had Arun Kumar, a wonderful very courtly gentleman, come. 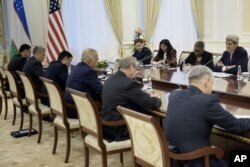 He is with the Department of Commerce, International Trade Administration and he had some very good meetings, including with Mr. Azimov and Mr. Ganiev and that helped us talk about our commercial relationship and ways we might make it easier for US companies to come and do business in Uzbekistan. That was very positive. And then, we had some cultural events that really were exciting for me. We participated in the International Jazz Festival in Uzbekistan. We had the Ari Roland Band come and that was a wonderful moment. Then, I had the great honor of going down to Samarkand in August to participate in the Sharq Taronalari Festival, happens every couple of years and our Deputy Assistant Secretary Daniel Rosenblum was there with us. To see the live show there in Samarkand was really incredible and we had a Native American group come from the United States and that was a fabulous moment. And then, of course, our capstone moment came in November when the visit of Secretary of State John Kerry who came to Samarkand and met with Foreign Minister Kamilov and his other counterparts from Central Asia to launch what we hope would be a successful platform for talking about issues and potentially, in the future, maybe looking seriously at some results. So it's some things we might do together with the Central Asian partners. That was a big moment to have the Secretary of State Kerry come, first time we'd had a secretary of state visit since Former Secretary Clinton came. I have to say my first year was a fantasy year. In the meantime, it was busy and I got to know our team, wonderful people working with us. I got to travel in Uzbekistan to Samarkand and Bukhara, to Khiva and to the big historical cities of Uzbekistan, eat lots of clove and be welcomed by many people. It was a very rewarding year, and I think that put us in a good place for this year. And this year, we're working on a number of issues and as soon as I get back to Tashkent next week, I'm very excited that the first business round table that we started out of the meeting with Arun Kumar and Minister Ganiev, that's going to be held next week on the 24th of March and at the same, the Department of Commerce will be bringing several key American companies for a trade mission. I got off to a very start in 2015 and I'm happy to say that many positive things happened in my first year and I'm looking forward to positive things happening in second year. Navbahor Imamova, VOA Uzbek: It seems like you are going to be very busy. Ambassador Spratlen: Yes, we're going to be very busy but we're going to have fun at the same time. Navbahor Imamova, VOA Uzbek: In the words of one Uzbek official, you're working very hard to strengthen the relationship. Navbahor Imamova, VOA Uzbek: He told me that you're working very hard and you've been aggressive at getting what you want done - that's a compliment. Ambassador Spratlen: I hope so. The word "aggressive" sometimes ... but certainly, I like to let people know that there's so much we can do in this relationship and we, as ambassadors, are so fortunate to have these positions. I'm lucky to be serving a wonderful president, President Obama, and we have a fabulous Secretary of State. I don't want to waste one moment of this great opportunity. It's so great. Navbahor Imamova, VOA Uzbek: And there are many challenges, as you know. Navbahor Imamova, VOA Uzbek: As you work your way to accomplish all these tasks in front of you, are there any legal restrictions that you have to deal with, the kind of restrictions that are set by the US Congress? The reason I'm asking you this is that the very well-known restrictions on military assistance in Uzbekistan that were a part of the State Department's budget for a while, are not there anymore. Can we now say that there are no sanctions against Uzbekistan from Washington? Ambassador Spratlen: What I would say is, Uzbekistan is a country that always draws a great deal of interest. In part, because of its vision of what is necessary in its view to maintain stability in the country. In part, because of its very unique positions geo-strategically and also because of its amazing history and culture. But there have, in the past, been concerns about human rights and other issues that have caused our US Congress to want to place restrictions. I don't want to suggest that every restriction has been removed and we don't necessarily fully understand the actions that were taken by the Congress last year. What I would say is that certain restrictions continue to apply on military assistance. However, I would also like to say that maintaining a good security relationship with Uzbekistan is a very great priority for me and for the US government and it's for that reason that I was very pleased to come back last month. I've had three trips to the United States this year alone, and last month in February, I came for what I call the bilateral defense talks, and that was a chance for our two militaries to talk to one another. Normally, the US Ambassador would not come, but because we had not had these talks in four years, I felt it was important to come and say this is important not only for our militaries, it's important for our overall bilateral relationship, because we do still face restrictions on the kinds of assistance that we can give to Uzbekistan and Uzbekistan still has its own restrictions on the kind of assistance it wants to receive from the United States. These talks were an opportunity for us to look at those two things and see what we might be able to do together and I'm very hopeful that our five-year cooperation plan will soon be approved. Uzbekistan made a decision last year that it would participate in our international military education and training program. We haven't yet have anybody participate in that but the policy decision of the government was a very positive one. I would say that this is a relationship that's dynamic, lots of things are changing. The United States does have certain concerns and I think members of Congress from a due diligence point of view, with US values and US law, would want us to look at these things very carefully, but there's also a recognition that Uzbekistan is a unique partner, uniquely placed to sometimes cooperate with us, as they did during Northern Distribution Network [supply route to Afghanistan], and as they do now in supplying electricity to Kabul and in having the only railroad that actually goes to Afghanistan. I would say that the partnership in the area of security is one that is evolving, one that is developing. Yes, we still have some restrictions but we also very pragmatically want to cooperate with Uzbekistan as Uzbekistan wants to cooperate with us, which each of us sees it in our mutual interest. Navbahor Imamova, VOA Uzbek: The Cotton Campaign, international coalition fighting the use of forced labor in the cotton fields of Uzbekistan, has recently asked the World Bank to suspend credits to Uzbekistan until the government stops, really really stops its use of forced labor. We know that the US has always supported the presence of the International Labor Organization in Tashkent and you have also, several times, said that there has been progress when it comes to fighting this issue. But the Cotton Campaign, doesn't think so. They actually think that the situation has gotten worse, especially last year, and our reporting actually confirms that, too. What is your position at this moment? Navbahor Imamova, VOA Uzbek: Character. Ambassador Spratlen: Yes. It plays a very important role in the psyche of the nation and in the economy, especially as a hard currency earner. Over the last few years, there has been great concern, as you point out, about the way that the cotton is harvested, and actually, the way it is planted and the way it is weeded as well. And Uzbekistan has said, itself, that it wants to modernize this industry, it wants to mechanize it and it wants to diversify the economy as a whole, and the United States fully supports that which is why we have backed their work with the World Bank and the International Labor Organization. I would like to just note that our own Department of Labor, which does a report every year looking at child labor, did say that their problems continued but it also recognized the progress that Uzbekistan has made in greatly reducing, almost eliminating, use of children in the harvesting of cotton, which we see as a very positive thing. It must happen and I think the government wants to do that and is taking strides to make it happen, but that leaves the issue of adults. Last year, the government said that it was going to work toward not mobilizing certain categories of workers, especially those in the medical area and in the teaching profession. Unfortunately, I think they got started rather late and they were not able to fully implement that. But I do think that if we look at this as something that's not going to happen immediately but something that the government is working very hard to change now, what I would say is I would like to see further developments in this. I take the government at its word that it is working on this and that it wants to change, and my hope is that very soon, through the process of reform and through the process of mechanization, through the process of eliminating certain categories of workers, that Uzbekistan will greatly reduce, and I hope eventually, completely eliminate the use, the mobilization of the population for the harvesting of cotton. Yes, I think this is a work in progress. Yes, this is something that the government itself is working on. I think the fact that it's cooperating with the World Bank and with the International Labor Organization on something called a Decent Work Country Program is extremely positive. There's much more work to do but I think it's important to give the government some credit for, first of all, it's recognition that this is an issue and second of all, its effort to take steps. Now what we have to do is have the rubber meet the road and actually implement the very, I think, important intentions that they have set up for themselves. Navbahor Imamova, VOA Uzbek: Have you ever advised the Uzbek government to talk to the Cotton Campaign? Navbahor Imamova, VOA Uzbek: But they have become a major player in this ... in fighting this issue. Ambassador Spratlen: They've become a major voice in the international community but it really is up to Uzbekistan as it is up to any government to decide which international partners it wants to work with. I do think, and I've actually talked to the Cotton Campaign myself. Today, as a matter of fact, I talked to one of its representatives, but I really think and I do want to say that I think that there is a role for the international NGO community, but I think it's up to the government of Uzbekistan to choose its own interlocutors and partners and well, I think that there could be a constructive role to be played by talking to the Cotton Campaign. It's up to them to decide who their interlocutors are going to be. Navbahor Imamova, VOA Uzbek: You have been spending a lot of time traveling around the country. How do you assess the economic situation, specifically, the business climate? The Uzbek officials who spoke here last fall in an annual business forum said that the country is wide open for American businesses, that the system is reforming itself very rapidly, and that Western businesses should feel comfortable enough to come in. But we also know that the corruption is still a way of life, things are really tough and you have this huge business scandal involving big mobile companies and the presidential family. US is investigating and there have been some major developments recently, and I know that you will not be commenting on this because I'm sure you will say it's still ongoing, but it has put the level of corruption in Uzbekistan on the world map. There is a global attention now to this incredibly huge issue. So, how do you see the business climate? Ambassador Spratlen: What I would say, we always say this, Uzbekistan is a unique. It's the only country in Central Asia that borders all the others, a country of more than 30 million people. A country with tremendous natural resources and great human capital. This is a country whose potential is enormous. It always has been and I think it will be in the future. I think that, right at the moment, Uzbekistan like every economy in the region is experiencing some economic turbulence. We've seen this in their exchange rate and we've also seen it with their major trading partners, the Chinese and the Russians who had some challenges, as had the Kazakhs. I think those do affect Uzbekistan. At the same time, I think the government has worked very hard to try to maintain a certain level of economic stability in the country, and I was recently in Termez and I was also in Navoiy last December and I was surprised to see some businesses opening up. I was surprised to see some economic activity but I have to say that I am disappointed that there aren't more American companies in Uzbekistan. And I think, as long as there are a few challenges that are well-known in Uzbekistan, it will be very difficult for more American companies to go. But I think American companies always look for advantage where they can find it. We have several associations of business people who are always looking for opportunity in Uzbekistan. As I said, I'm excited to be going back to this round table next week and I do think American companies can play a very important role in Uzbekistan. They have a number of laws that they have to respect, make sure that their business operations are very clean and they keep that in mind as they make their business deals around the world including in Uzbekistan. I think that managing the challenge of an economy that probably is more grey than everyone would like to see, this is something that I think is going to change overtime, as I think, the government moves on its own reform program. I think a lot of lessons have been learned and my hope is that in the future, it will be possible for more American companies to be present in Uzbekistan, both in the area of trade and in the area of foreign direct investment. Other couple of good examples of American companies that are there now but have only a handful of examples that you can count on one hand, that is not success to me, so I hope that the ... and we always talked to the government about what we think is necessary in the business environment to make it more favorable for US companies to be present in Uzbekistan, and I will continue to work for that as long as I am there. Navbahor Imamova, VOA Uzbek: Many young people in Uzbekistan, as well as professionals, write us, ask us about opportunities in the United States, specifically educational opportunities, training opportunities, and we usually refer them to the US Embassy in Tashkent. Navbahor Imamova, VOA Uzbek: But there aren't many programs to apply and we know that you have been talking about the importance of exchange programs, trainings and people-to-people engagement. Is there any progress? Can we expect any new programs in the future or the old ones to come back? Ambassador Spratlen: These programs are really near and dear to my heart. I think there's just nothing better than being in that sweet spot of life as a high school graduate going to university. It's just a golden time, and it's wonderful to attend university anywhere, and I was very pleased to be in Termez last week and I got to meet the rector and some of the students at Termez State University, a university of over 7,000 and some interesting programs. But I said to them what I say to students everywhere. If you have an opportunity to leave your own country and go study elsewhere, what a tremendous opportunity that is. You can go and learn so many things. You can go and prepare yourself in so many ways and bring that training, bring that education, that world view back home and share it with other people. That's what our education exchange programs are all about. Navbahor Imamova, VOA Uzbek: It's not always easy to do that. Ambassador Spratlen: It's not always easy to do that. There are issues of cost, there are issues of competition, there are issues of budget. Our resources are limited and we can't have all, unfortunately, I would like have double, triple the number of students that we have going from Uzbekistan now. But I would say that among the countries of Central Asia, we had the biggest spike in percentage terms of students going from Uzbekistan to the United States to study and many other countries. We now have not quite 500, a little less than 500 students who are studying in the United States. Navbahor Imamova, VOA Uzbek: You're fighting for it. Ambassador Spratlen: I'm going to fight for every student who is eligible and desires to go to the United States and has the authorization to do it to get there, because it's so important to Uzbekistan and it's so important to the United States. Navbahor Imamova, VOA Uzbek: How about also getting American media into the country to be able to report from there, so we get to see what's really happening inside. Because, you know, how the Western media are always criticized for not covering the country well or fairly or accurately. Do you think that we are missing a lot by not being there? Ambassador Spratlen: First of all, let me thank the Voice of America because you are playing an extremely important role. You are broadcasting across many platforms in the local language in Uzbek every day, and I think that's extremely important because you are, for many people, the daily window on the world. Certainly, the daily window on the United States, so keep doing what you're doing because I think that's extremely important. I think, of course, we'd love to see more international outlets in Uzbekistan. From the point of view of the United States, the press plays a tremendously important role in bringing issues to light, in educating the public and helping in opening the world. And so, yes, I would love to see many more press outlets present in Uzbekistan. I think that's going to be a hard thing to try to achieve in the short run, but in the long run, I think a more open press environment and more press outlets is absolutely in the interest of Uzbek citizens. It's in the interests of the press as a whole. It's in the interest of the strength of Uzbekistan's ability to really tell its own story and make sure that it is understood by talking to reporters in country, but I think that that's going to be something that develops slowly over time. Navbahor Imamova, VOA Uzbek: Thank you so much. Ambassador Spratlen: You are very welcome. I wish you the very best and to all of your listeners, all of those who are watching, I want to just say thank you for welcoming me and making me feel so happy to be present in a wonderful country that Uzbekistan is. It has wonderful potential. It has some problems but we want to help Uzbekistan work on those for the benefit of all 30 million-plus people and of course, my own citizens of the United States of America. Thank you! "BMTda O'zbekiston bilan shug'ullanuvchi maxsus organ kerak"